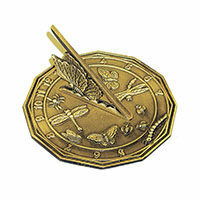 Garden Sundials are unique time telling pieces with roots in ancient societies. When placed at the correct angle, sundials use the sun to tell time as well as being beautiful and ageless decorative items. 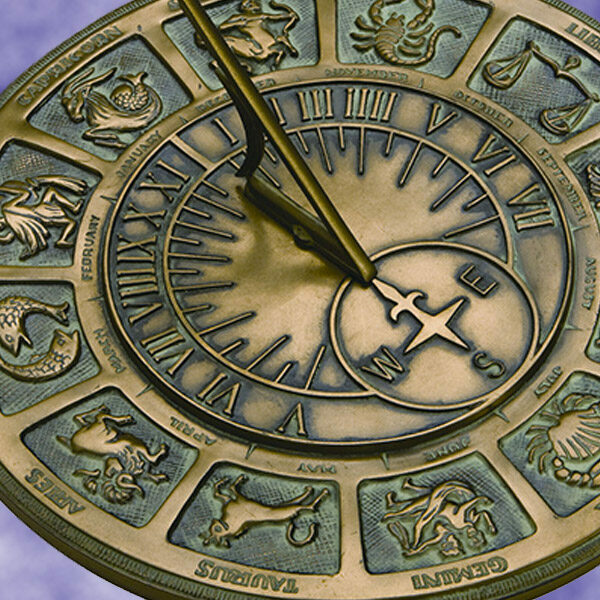 The information found on this page will introduce you to the large variety of sundial and sundial base selections available including popular brass, bronze and cast iron finishes. Place a sundial featuring your favorite finish and design in the garden or yard to add a decorative and functional accent to your outdoor space. Sundials have come a long way since they were first invented. Once just a stick in the sand or marks on a wooden shoe, sundials have turned into beautiful timepieces that can be passed down through generations. Multiple societies simultaneously had sundials such as Egyptian obelisks and Babylonian shadow clocks, but the modern sundial was perfected by the Romans. 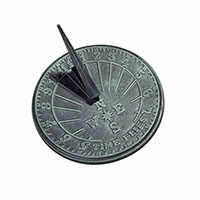 The Renaissance saw an increase in sundial production, and the sundial became a cornerstone of time-telling society. 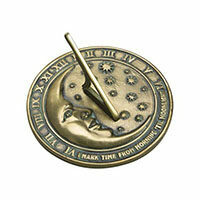 Currently, the sundial is used more for beauty than telling time. The largest sundial, the Tapei 101, is located in Taiwan and is actually a skyscraper that tells time by casting a shadow on its adjoining park. Sundials come in many different designs with the same basic theory. When positioned correctly, the sun casts a shadow on the gnomon marking the Roman Numerals or lines on the sundial giving you the time. Sundials come in either the traditionally round shape or as an armillary sundial, which appears more like a globe with an axis running through. 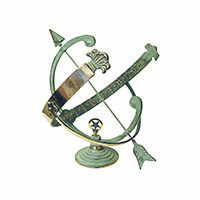 While horizontal sundials certainly make a statement in your garden, nothing takes your breath away quite like an Armillary Sundial. While an arrow serves as the gnomon and numbers are placed on a curved band, it gives you the time just like a horizontal sundial. Armillaries have some of the same features as horizontal sundials. 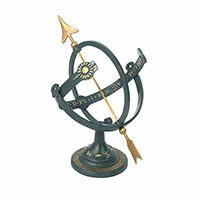 You can place these sundials on a flat surface or on a pedestal base for added height and elegance, and Armillary Sundials are designed to be used with cast column pedestal bases. 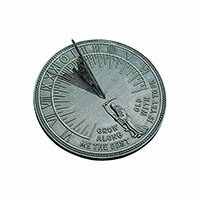 Sundials are offered with inscriptions, like Robert Browning's quote, "Grow old along with me! The best is yet to be," or Thoreau's motto, "Heaven is under our feet as well as over our heads," and some sundials have features that indicate seasons, sunrise and sunset time, astrological signs and directions on a compass. Because of the immense range, there is a design for everyone. 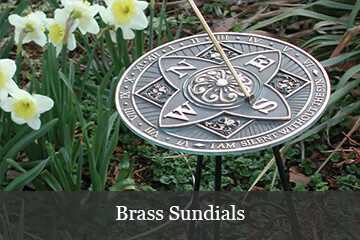 Brass Sundials are shiny and require little to no maintenance. 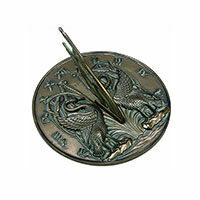 These sundials are finished with polished brass highlights over a dark patina color. 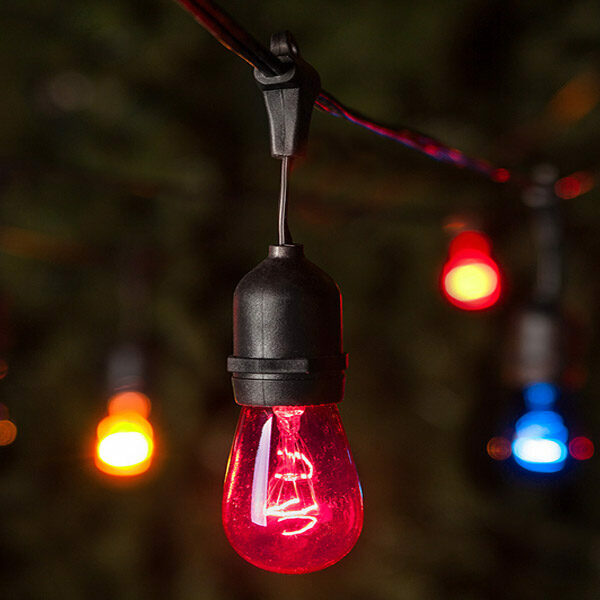 They will age gracefully and naturally over time to a full patina or greenish color. Brass Sundials are also naturally non-rusting. If you want to keep the bright finish, use brass polish when needed. Sundials look and work best when placed on a pedestal. 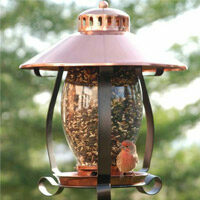 Sundial Bases will bring attention to your sundial and accent your garden. The majority of sundial bases and pedestals are manufacturer specific, so if you are unsure of whether or not your sundial and base match, we'll be more than happy to answer your questions. Please feel free to call our Customer Service toll free number - (800) 967-7654.